Hot Air Balloon Flights are scheduled twice daily; early morning & late afternoon. All ballooning activities including static display, tethered rides and balloon flights are weather dependent. The decision to inflate hot air balloons is made just prior to the scheduled ballooning activity. Due to limited entrance points into our festival, guests are to review festival parking options via the website. On-site parking can be purchased in advance or patrons can take advantage of the FREE charter-bus shuttle system, which transports guests and their items (chairs, bags, strollers, etc.) on a 10-minute ride to the festival. Shuttle parking is located at 630 N. Main St, Troutman, NC. Due to the weather-dependent ballooning events, tickets are non-refundable. However, the festival also hosts live, all-day entertainment on 2 stages, a kids zone, artisan & marketplace village, NC wine & craft beer garden, an on-site circus, and so much more. 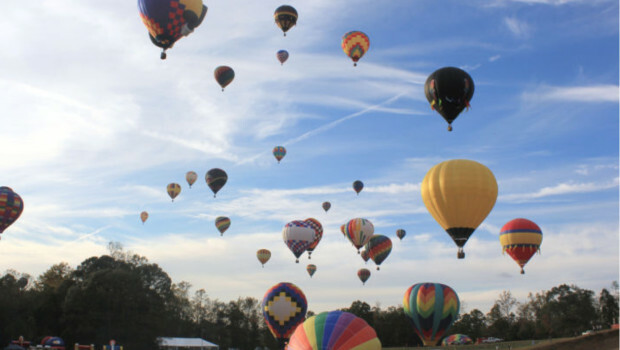 The Carolina BalloonFest is a 501(c)(3) nonprofit which donates a portion of its proceeds back to the community on an annual basis.